I still think that you can take nice photos with a phone camera or with a point and shoot camera. The image above was shot with one of both, I guess it was my phone back then but I am not sure. At the end it’s about the right place and sometimes also about the right time. But if you are in a good place, it’s always worth a shot, no matter if it’s just a phone or a point and shoot camera. I don’t want to forget the photos that I shot with these devices, that means sometimes I start to browse my old folders and find interesting photos. 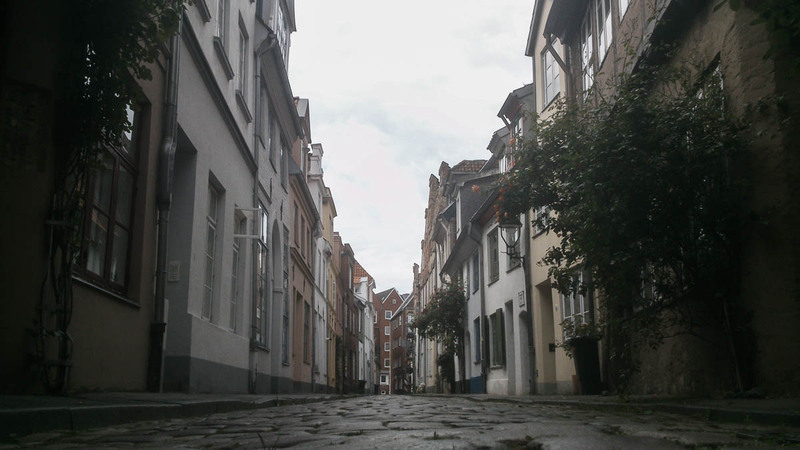 The photo in this post is interesting because it shows one of the beautiful alleys in the historic district of Lübeck. I like how I shot the photo back then, because the perspective shot from the ground is interesting, it makes the world look bigger. I hope you like this photo too. [ Smiles ] Yes, Dennis. That is a beautiful view of a side street! – If you are interested in history, especially Baltic history and about the Hanseatic League, you might find the Hanse Museum interesting: http://www.hansemuseum.eu/language/en/ and everything around it is interesting too. You can for example be on top of it, just use the stairs up and you will find a nice place on top with a good view on the Trave river. – You can enter the Marienkirche (St. Mary’s Church). Last time I was there it was like 2 Euro fee to enter. It’s interesting for architecture photography. And about history too, you can find a large shattered church bell on the ground that is still there as a reminder (the bell fell to the ground during WW2 bombings). – St. Petrikirche (St. Petri Church) is interesting because you can use the elevator to the top of the church where you will have a nice view over our city. – You can stroll along the Trave River. It’s even possible to walk around the inner-district if you hike along the Trave River but use Google Maps because there are tributary channels, bridges and at some points it might confuse foreigners 🙂 But you will find some beautiful parks along the River. – Related to the Trave River, especially behind the Holsten Gate when you come from the train station direction, there are very interesting restaurants close to the River or public seats where people hang around and enjoy their day. – If you are already here, don’t skip Travemünde at the Baltic Sea, or Timmendorf. Travemünde is 20 mins by train if at all, ask in train station they speak English. Althought more difficult, but quite interesting is to drive to Timmendorf by train and hike to Travemünde along the Baltic beach. You can find a steep coast there like shown in my post: https://diaryofdennis.com/2017/04/06/bay-of-lubeck-brodtener-steep-coast/ but this is quite a hike and you need Google Maps since you are not a local! There are probably many more interesting things, and I guess you will find out. I just thought to mention a few things! Enjoy your holidays here. And let me know if you write a blog post about the city I live in! I like to see how other people experienced it here. I sometimes search for “Travel to Lübeck” posts to find out if foreigners liked it here! 🙂 If you write a post, I will read! You’re welcome! Have fun in Lübeck!